We are delighted to announce that AskMen, the No. 1 men’s lifestyle magazine online, has launched an ebook publishing program with the PressBooks Publisher platform — which provides a public-facing book catalog/website, along with ebook book production. When we got started with PressBooks, one thing that excited us most was the idea of new book publishers (not just authors) who would emerge as the (mechanical) cost of producing and distributing books goes to zero. So, I was thrilled when Emma McKay, Managing Editor at AskMen contacted us about helping her get a new ebook program off the ground. She had some existing content, as well as a pool of writers with stories that needed to get out. After playing with a number of tools out there, Emma picked PressBooks. I asked Emma what she liked about PressBooks, compared with the other tools she tested, and she answered: “PressBooks is straightforward and intuitive, and the ebooks look great on all the devices we tested on.” Which we’re happy about, since making a simple tool with beautiful outputs is what we wanted to do. AskMen did two books with us to test the waters, and in October, decided on a bigger project: they planned to get 7 books out the door before the end of the year. Well, Emma and her team at AskMen did meet the deadline: 7 books, live on a PressBooks Publisher site, and out in ebook retailers (through PressBooks distribution partner, INscribe Digital). All in less than 3 months. It’s fantastic. 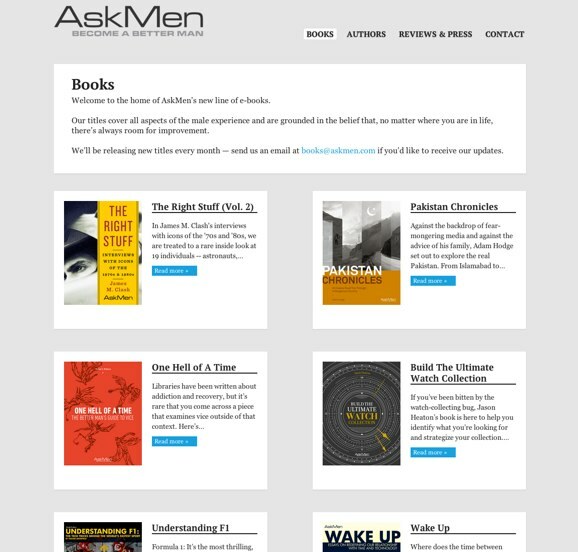 AskMen’s first collection is an exploratory group of books, with a mix of titles ranging from extreme adventure travel (Pakistan Chronicles, by Adam Hodge, a man’s journey through the real Pakistan), psychology (One Hell of a Time, by Michael S. McKenna, a look at the impulses that make us overindulge), and the laddish (Understanding F1, by Fraser Masefield, which gives an overview of Formula 1 racing). We’re going to see a lot more of this, publishers who are working by a whole different set of rules than traditional book publishers are used to. Want to price at $1.99 or $4.99? Let’s try it. Seven books, from start-to-finish, including a new website and production tool in 3 months? Let’s do it. With tools like PressBooks, publishers have flexibility, control, and speed – and they will start using it more and more. AskMen joins fellow ebook “upstart” Jason Ashlock, whose Movable Type Management partnered with PressBooks in September to launch crime publisher, The Rogue Reader, also running on a PressBooks Publisher platform. The Rogue Reader has now put out four novels: Under the Dixie Moon and Under the Carib Sun (by Ro Cuzon), Dog Hills and Sistine (by Michael Hogan). They’ve released a number of shorts, and just published Dreaming of a Noir Christmas, with contributions from Cuzon and Hogan, as well as new Rogue authors Edward Weinman Don Rearden. Askmen and Rogue are two great examples of publishing entities emerging to embrace the flexibility that PressBooks and tools like it provide. We’ve seen other, perhaps more high-profile announcements recently, notably the NYTimes ebook program with Vook. We will see more. Many more. Authors will publish many more books themselves. New publishers will emerge, publishers born of digital, who will look at this whole business differently. Things are about to get very interesting in the world of books.